Today has been another record-breaker at Sacrewell as for the first time ever, we welcomed our 90,000th visitor of 2014 through the door. 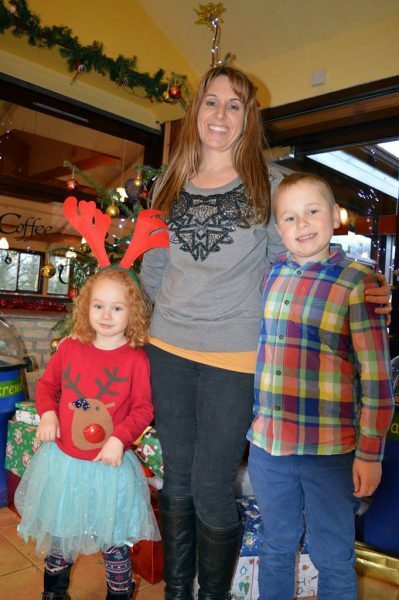 Lucy Squance and her children Amelie, four, and Daniel, eight, popped in to visit us from Gamlingay near St. Neots as they were on their way home from Lucy’s work Christmas lunch. They were visitor numbers 89,999, 90,000 and 90,001. Lucy works as a fundraiser at Sue Ryder’s Thorpe Hall Hospice in Peterborough which Sacrewell recently supported through an auction with BBC Cambridgeshire. Marketing executive Megan Allen said: “It was a team goal to reach 90,000 visitors this year and we’ve been carefully monitoring the footfall numbers for days. The previous footfall record was set in 2011 when the visitor centre welcomed 85,930 visitors. As a surprise, Sacrewell gave the Squance family a free visit to see Father Christmas. Megan added: “This is a wonderful way to end our 50th anniversary as a charity and a record-breaking year at Sacrewell. “We won’t know our official total until new year’s eve but will definitely be celebrating.